The girth hitch is used to attach a runner to an anchor or piece of equipment. It is a special-purpose knot. STEP 1: Form a bight. STEP 2: Bring the runner back through the bight. STEP 3: Cinch the knot tightly. 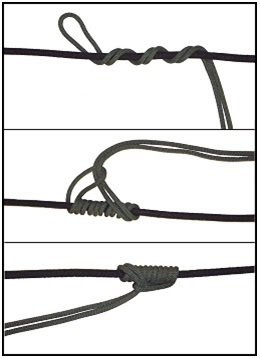 The guarde knot (ratchet knot, alpine clutch) is a special purpose knot primarily used for hauling systems or rescue. The knot works in only one direction and cannot be reversed while under load. STEP 1. Place a bight of rope into the two anchored carabiners (works best with two like carabiners, preferably ovals). STEP 2. Take a loop of rope from the non-load side and place it down into the opposite cararabiner so that the rope comes out between the two carabiners. The Kleimhiest knot provides a moveable, easily adjustable, high-tension knot capable of holding extremely heavy loads while being pulled tight. It is a special-purpose knot. STEP 1. Using a utility rope or webbing offset the ends by 12 inches. With the ends offset, find the center of the rope and form a bight. Lay the bight over a horizontal rope. STEP 2. Wrap the tails of the utility rope around the horizontal rope back toward the direction of pull. Wrap at least four complete turns. STEP 3. 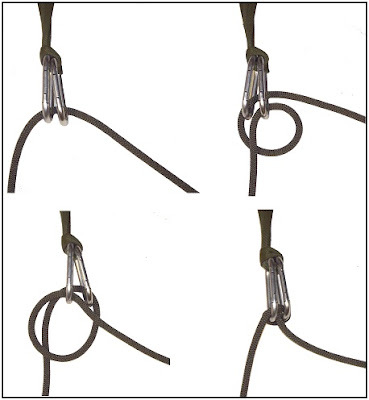 With the remaining tails of the utility rope, pass them through the bight (see STEP 1). STEP 4. Join the two ends of the tail with a joining knot. STEP 5. Dress the knot down tightly so that all wraps are touching. Note: Spectra should not be used for the Kleimhiest knot. It has a low melting point and tends to slip.